Plasma arc plasma gasification reactors do not require moving grates and the smaller volume of gases generated means that the plasma arc plasma gasification reactors can accommodate the required minimum residence times in a smaller volume. (Residence time – sometimes referred to as removal time – is the average amount of time that a particle spends in a particular system, which is important in hazardous waste or industrial waste processing to ensure that any toxic nature in the feedstock was exposed to the high temperatures generated within the plasma arc plasma gasification for a certain period of time). Additionally, the smaller gas production and reducing environment (condition in which oxidation is prevented) within the plasma arc plasma gasification reactor does facilitate smaller sized air pollution control systems as a smaller volume of gas is required to be cleaned as compared to a combustion process. Previously, this forum has demonstrated how plasma arc plasma gasification nearly eliminates dioxin formation, semi-volatile heavy metal compounds and other air emissions when processing various forms of industrial waste or hazardous waste. Below is a summary of a June 2013 third party emissions testing conducted on the PTDR-100 plasma-arc, plasma gasification system located in Shanghai. The summary also compares the results to current European air emission regulations. 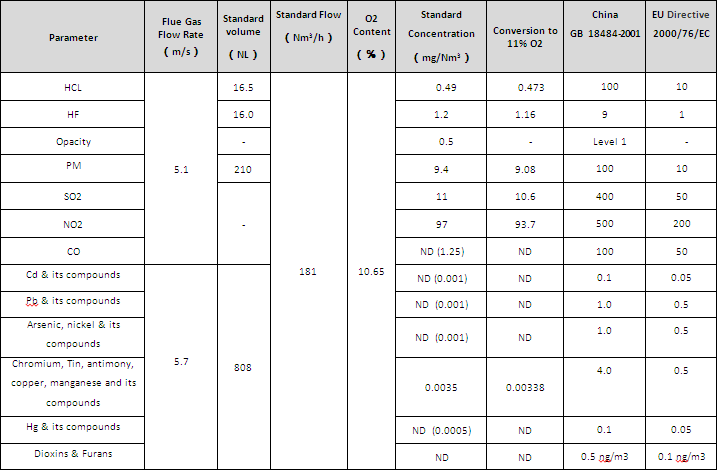 It is worth noting that the above emissions for the PTDR plasma arc, plasma gasification system were measured when the syngas was thermally oxidized. It is worth noting that if the syngas is utilized in a gas engine or other syngas utilization equipment, then the only gas emissions associated with a PTDR plasma arc, plasma gasification system would be the exhaust from the engine or boiler, etc.